Carlos Aires participated at Coup de Ville 2013. This text was published in the catalogue. Fascinated as Carlos Aires is by baroque religious art, his early works are characterized by their exuberance and drama, whereas in his recent development he pursues greater soberness. What remains unchanged is his attention to detail and his eye for the finesse and expressiveness of materials combined with meticulous artisanal workmanship. The part of reality that interests him most, however, remains the sinister side of existence and is found in the shadow of systems of power. 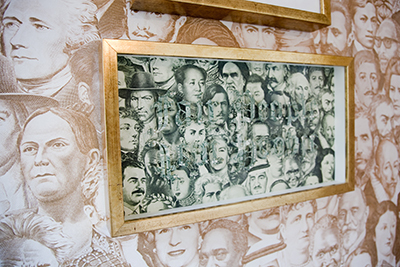 The use of collage and particularly the cut-up technique with which he gives form to his content evokes the strategy of détournement (diversion/derailment) such as was launched as a concept at the end of the 1950s by Situationist International (S.I). This revolutionary movement, established in Paris under the impulse of Guy Debord, was opposed to the alienation of capitalist consumer society and inspired the uprisings of May ’68. Today Spain seems to meet the conditions of a pre-revolutionary phase, particularly when one summarizes a few notions that are frequently associated with this country: government debt, extreme (youth) unemployment, poverty level, wage restraint, European Emergency Fund, social gap, indignados. 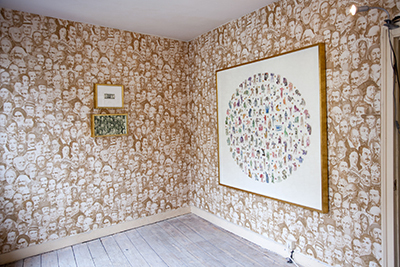 Aires focuses his attention with a subversive attitude on the material and symbolic status of money and uses it to create wallpaper. It is forbidden by law to cut up money. Despite the fact that people own money in its material form, in fact it belongs to the National Bank of a respective country. Every nation-state is always visualized by a national hero on its paper money. The ideological path that these heroes walk often seems slippery or turns into greed, making its moral status rather questionable. Carlos Aires stubbornly conducts his personal version of historical criticism and rewrites history by means of collage and cut-ups. Under the title ‘Disasters’, he adds other events or figures to these ‘heroes’. These are women (victims) or simply disasters that result from the political-economic policy that is implemented. 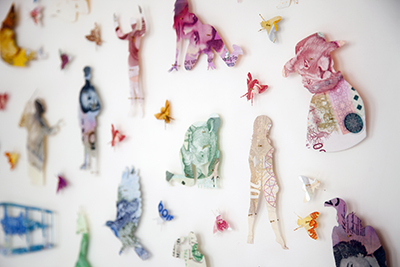 The pinned-up silhouettes refer to insects from a taxidermic universe and clearly refer to death.